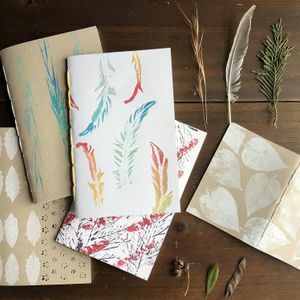 Sunday, May 20, 2018 noon-4 p.m.
Join graphic artist and Schoolhouse Farmhouse owner Lauren Giordano to learn basic bookbinding structures, stitches, and tools and to explore techniques for monoprinting from found objects. Using hte skills learned, students will print covers from collected items and construct a hand-sewn, saddle-stitched field guide. All materials are provided. Workshop limited to 5 participants.